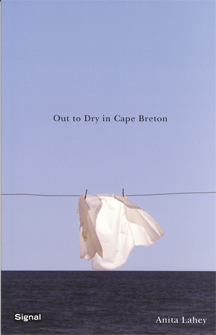 Like the laundry that greets readers at the start of Anita Lahey's astonishing debut-hanging on clothelines and bodied out in breezes-the poems in Out to Dry in Cape Breton exist in a state of thrumming levitation. Lahey's scampish play with idioms, her accelerated sense of traditional forms, and her omnivorous eye for fresh imagery lead to a poetry constantly streaming with surprises. These are musical, hyperstimulated, shape-shifting poems that draw on their subjects-a high diver, World War I female munitions workers, a mangled shopping cart-to conduct inspired, often irreverent, investigations into the marginal details of our world. The collection concludes with a long poem where Lahey's gifts combine to create a large-spirited, unsentimental vision of a Maritime world free of fiddlers and romantic fishing tales: one instead brimming with honesty, humour, paradox, and grit. Anita Lahey's poems have appeared in the Malahat Review, the Antigonish Review, Prairie Fire, This Magazine, in Ottawa buses as part of the Transpoetry competition, and in The New Canon: An Anthology of Canadian Poetry. She has won the Great Blue Heron Poetry Contest, Ralph Gustafson Prize for Best Poem, and first prize for poetry in Pagitica's annual literary competition. Lahey is the editor of Arc: Canada's Poetry Magazine and lives in Montreal.